The heart of our information-affluent society beats at the datacenter. With the entire Internet infrastructure now evolving around it, datacentre traffic is experiencing a relentless growth of over 25% reaching several billion Gigabytes per year. Over two thirds of this traffic resides within the datacentre, whereas the emerging disaggregated-datacenter model is expected to further increase this trend, posing inordinate challenges to traditional network technologies. The most daunting one is scalability; traditional “fat tree” architectures scale super-linearly with the number of servers, imposing a roof on the maximum economically-viable datacenter dimension. Performance-wise, traditional architectures are designed for north-south traffic and face fundamental limitations to keep up with inter-datacenter traffic demand expanding along the east-west axis. What is more, separation of the compute and storage networks, as well as their associated communication protocols further fragments network resources in the datacenter. 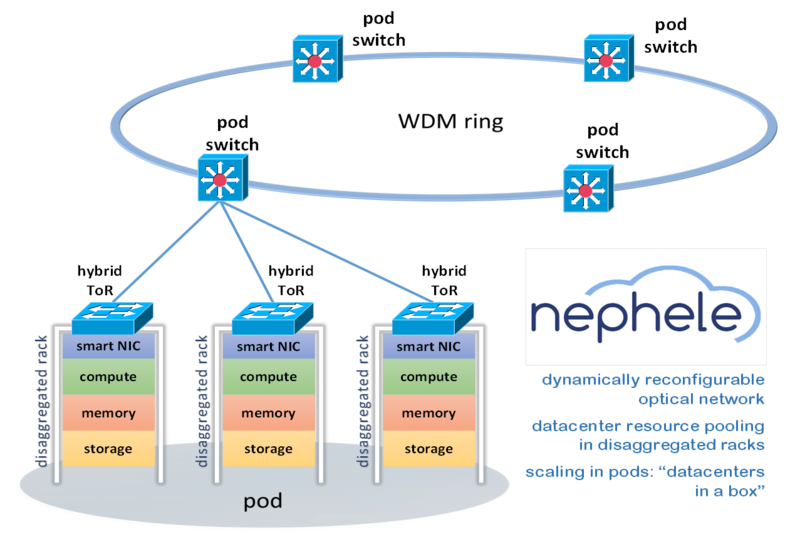 NEPHELE’s hybrid electronic-optical network architecture scales linearly with the number of datacenter hosts and consolidates compute and storage networks over a single, Ethernet optical TDMA network. Low latency, hardware-level dynamic re-configurability and quasi-deterministic QoS are supported in view of disaggregated datacenter deployment scenarios. A fully functional control plane overlay is being developed, comprising a Software-Defined Networking (SDN) controller along with its interfaces. The southbound interface abstracts physical layer infrastructure and allows dynamic hardware-level network reconfigurability. The northbound interface links the SDN controller with the application requirements through an Application Programming Interface. 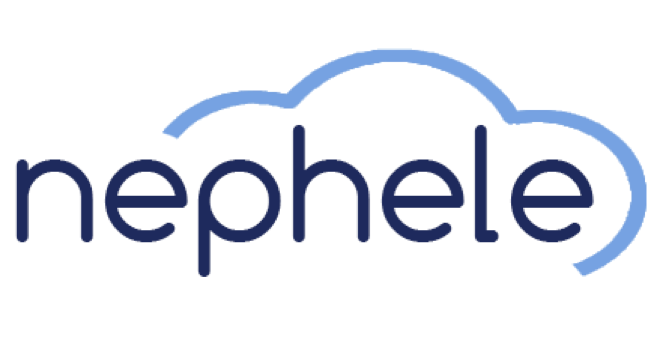 NEPHELE’s innovative control plane enables Application Defined Networking and merges hardware and software virtualization over the hybrid optical infrastructure. 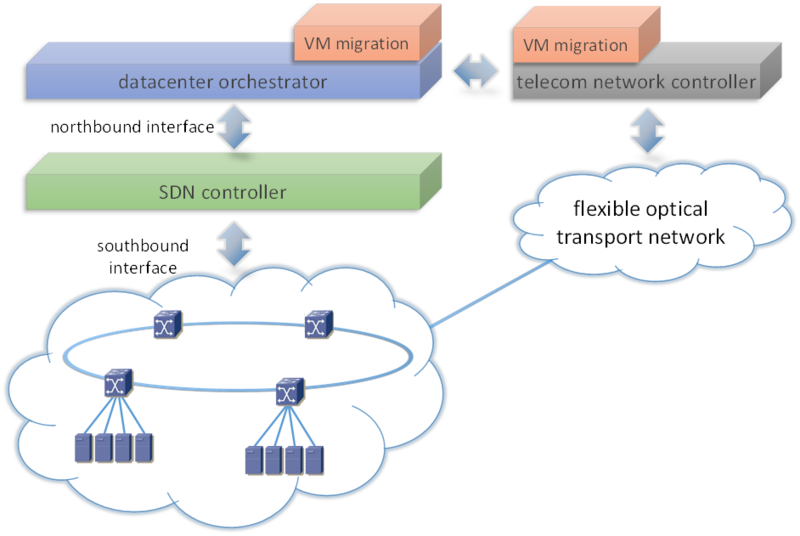 It also integrates SDN modules and functions for inter-datacenter connectivity, enabling dynamic bandwidth allocation based on the needs of migrating VMs, as well as on existing Service Level Agreements for transparent networking among telecom and datacenter operators’ domains.